Blame the blustery, snowy New England weather. But all I want to do is curl up on the couch, sipping tea with a good book or watching a great movie. When the weather turns chilly, nothing warms you up like a hearty bowl of soup. This weekend, I watched Giada at Home with my fave celeb chef, Giada De Laurentiis. She makes incredibly delish dishes that are easy to veganize. She whipped up an Artichoke and Fresh Mint Soup with ingredients she had lying around her house. Hmmm…I was skeptical. Would I have these alleged common ingredients?? Celery. Check. Veggie broth (she used chicken broth). Check check. Canned artichokes. Triple check! I actually had all the ingredients except an onion, which I usually keep on hand, and fresh mint, which I’ve never bought before. But I should so I can make mojitos…mmmm….mojitos….yum! I love artichokes. I usually devour them in pasta (like this Artichoke & Olive Pasta) and salads. But I’m always looking for more ways to eat them. This might be one of the easiest recipes I’ve ever made. You saute some veggies. Add broth and more veggies. Simmer. And then toss it all into a blender. And voila…soup! When hot, this soup is perfect in the winter. Yet it would also be ideal served chilled in the summer. Somehow it’s both light AND hearty. Artichoke hearts possess a unique flavor: delicate, nutty and with a little tang slightly reminiscent of vinegar. Sautéed onions and celery are always the perfect base for soups. The pungent fresh mint bursts with a crisp sweetness. And the citrus of the lemon juice brightens the whole dish. If you like spinach and artichoke dip, you’re going to love this creamy yet refreshing soup. 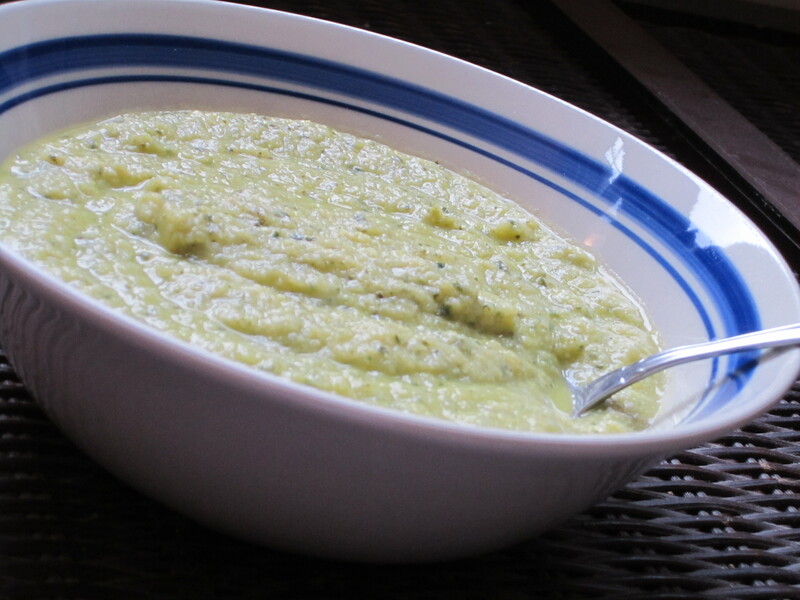 Click here for the recipe for Giada’s Artichoke & Fresh Mint Soup. Tags: Artichoke, Food Network, Giada De Laurentiis, recipes, soup, vegan, vegetarian. Bookmark the permalink. Thanks to a dear friend who grows mint, I finally got to test out this recipe. Soup in summer? you exclaim. Here’s what’s great: you have it warm or chilled. The nutty, buttery flavor of the artichoke provides a great compliment to the fresh-chopped mint and spinach leaves. Take a look at original recipe on The Food Network. Many thanks to The Opinioness of the World for sharing this great recipe. I will have to try this soon! I’ll let you know how it turns out Meg!